This post is for everyone. And that means, the police officers, the police web managers, those in the media, but most of all, the public. One of the things people compliment me for is making difficult things easy to understand. Note: To see the small images, click on one, it will open in a fullscreen lightbox, and just flick through them all. What follows is one spreadsheet, twelve charts and a few well placed ideas. For me, it's a work in progress, not a fast blog post and walk away. But a passion and a hunch that I believe the time is right to take tweets, photos, videos and make them sing from the page in realtime. One of the burning passions I have is Google+ Hangouts On Air. So far, UK Police have used them four times. I'm delighted - more will come. The big question is how fast will the rest follow? There are also forty one newly elected Police and Crime Commissioners, many who are putting among their top priorities being highly visible and vocal in leading the debate about crime and policing. 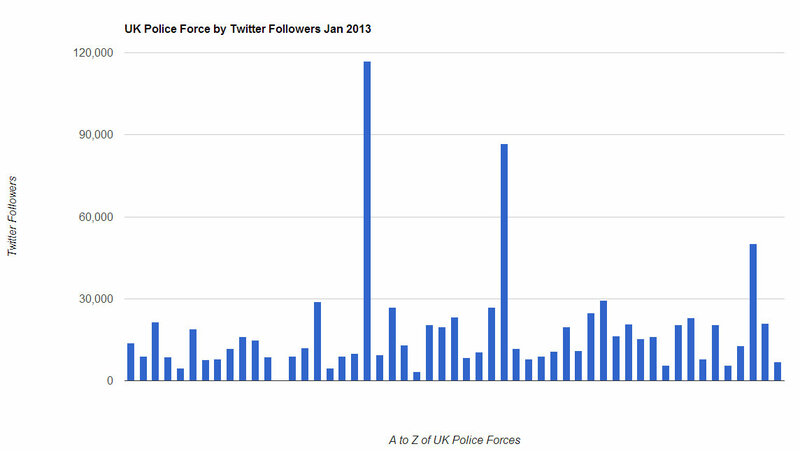 The Police first made the move into Social Media to engage with their communities in 2006/7 with Twitter emerging in 2009. 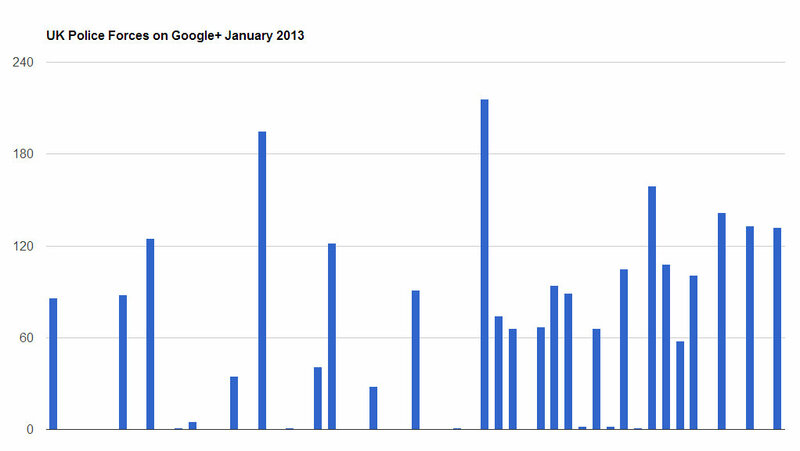 You can see Google Trends below, notice the spike for August 2011 (the Riots of course). The Data Sheet By using Google Docs Spreadsheet for the data, I've just made everything move at light speed. 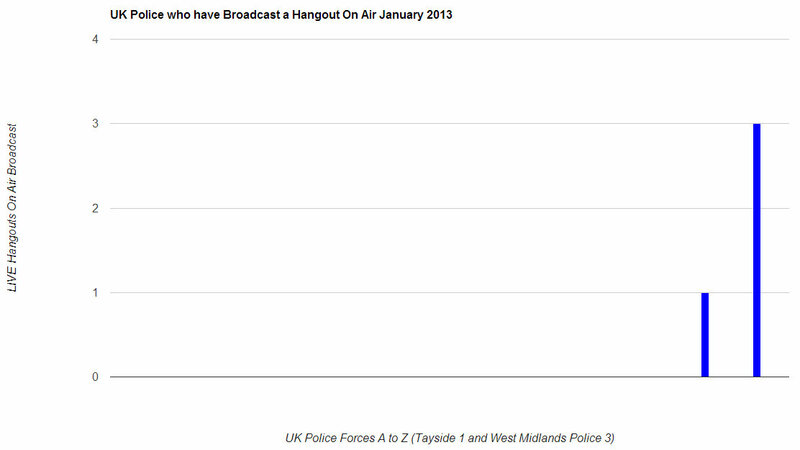 You'll find one live sheet called UK Police Forces using Social Media: Twitter, facebook, YouTube, Google+ and Hangouts On Air - The January 2013 Survey which is public on the web, can be embedded anywhere and available in a host of formats for download. Here it is embedded..
Open this document in a new browser window .. The UK Police Forces It seem there are fifty six police forces in the UK. I can gather data on fifty three. For Social Media, and I didn't even know these existed, some are specialist and not so suited to these tools. From the remainder, we have one as a specialist force, the British Transport Police, where they have six million people, but no defined area as such. What follows on the sheet, is a collection of Twitter followers, facebook likes, YouTube subscriptions, Google+ Circles and Hangout On Air Broadcasts. One important point I need to make. 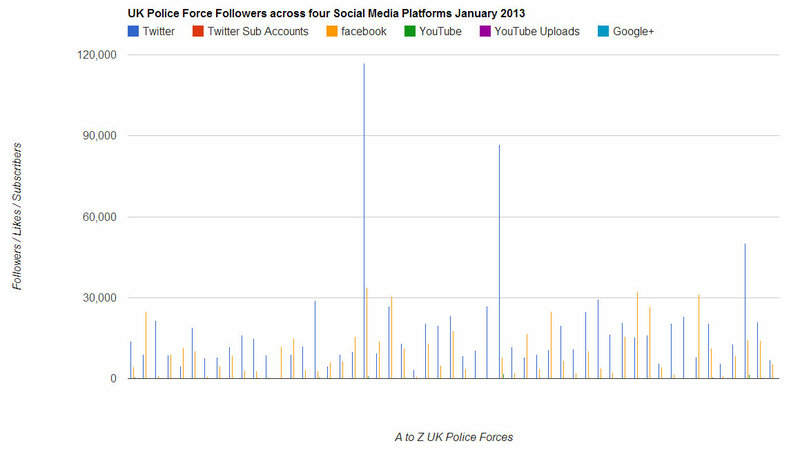 I'm a teacher, and I see this data not as a popularity contest or a competition, but a detailed examination and education into the changing face of Social Media in UK Policing. So, I'm not listing all the large accounts, citing follower numbers and highlighting those accounts that could do better. You can do that for yourself. 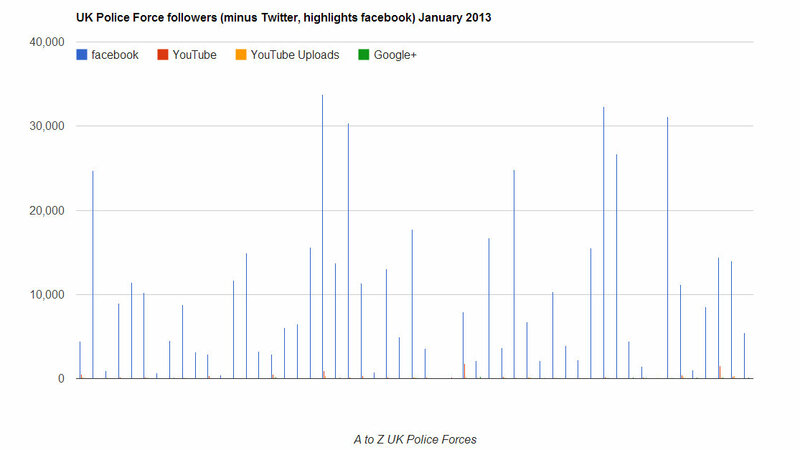 For Twitter, 98% of the police forces have an account with an average of 18,000 followers. These are for the main lead force account. 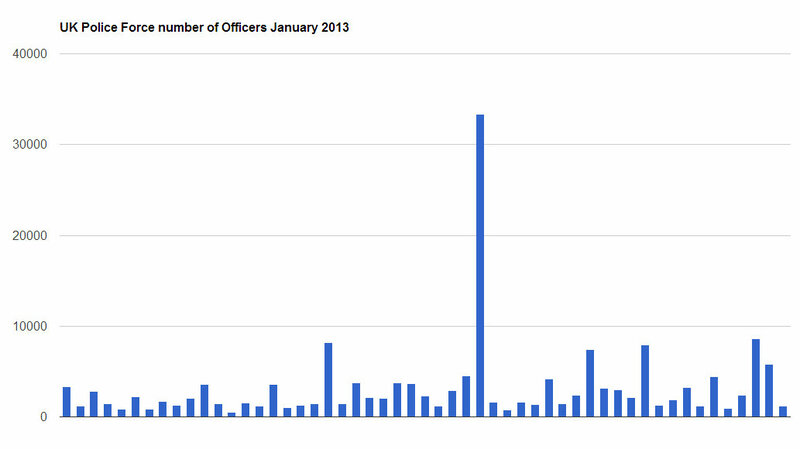 There are another 1,197 (Nick Keane, Lists I, II & III) accounts for departments and officers who tweet. One inspiring statistic, twitter follows will exceed one million people in a few months time. For Facebook, we have 96% of forces having an account. Over half a million people liking posts with 10,000 average to liking. 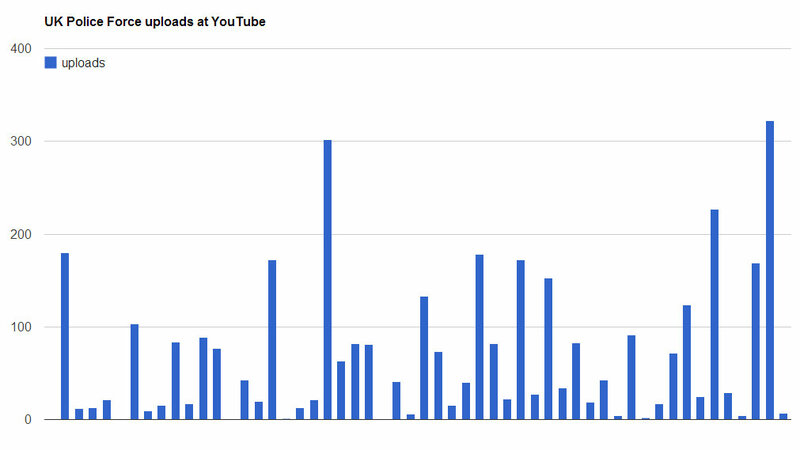 With YouTube comes to sets of data, the subscriptions and the video uploads. Some police forces are uploading videos like the world is going to end. Great work and keep it up West Yorkshire Police (322). 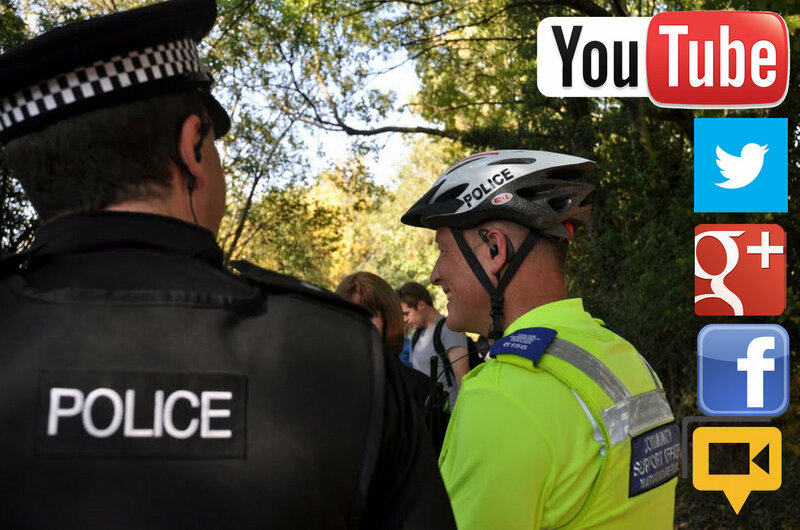 The brilliance of the Google products, letting me create a 200 video Playlist: UK Police Force Videos on YouTube & Hangouts On Air for all the Police Uploads in the last year (they are sorted by date). 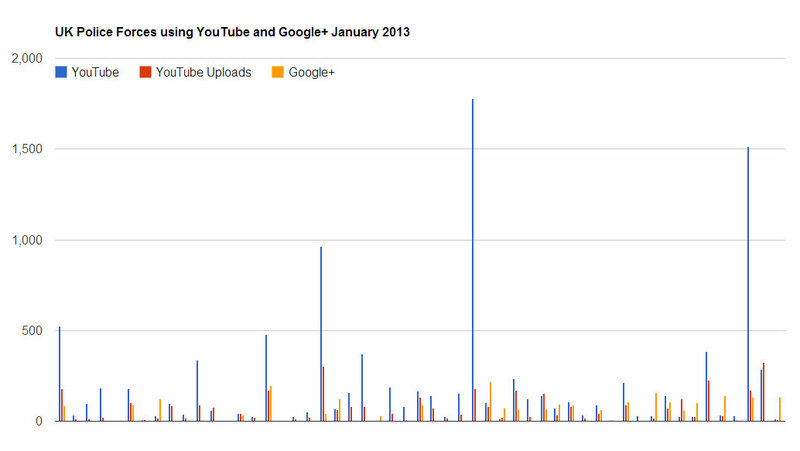 Google+ is a new platform with 45% of forces having a page. I'm not unduly concerned with that as I've an ace up my sleeve. Using twitter as the go to platform, creating a hashtag for a LIVE Video broadcast sent to YouTube, all courtesy of Hangouts On Air. The fact that Google+ powers the event is irrelevant for the audience. 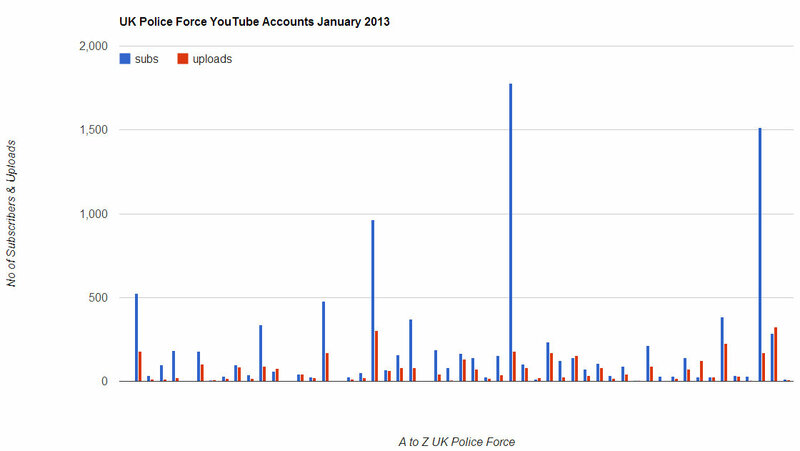 All you need to know is your local Police Force will be LIVE at YouTube. Fantastic. What makes all of this quite breath taking is how Google have done all the heavy lifting for us, for free. Hangouts, realtime video for up to ten people, LIVE at YouTube is like having a mini TV Station literally in your pocket. What I've outlined here, is not about the police at all, well yes it is, but it could apply to any industry, anywhere. 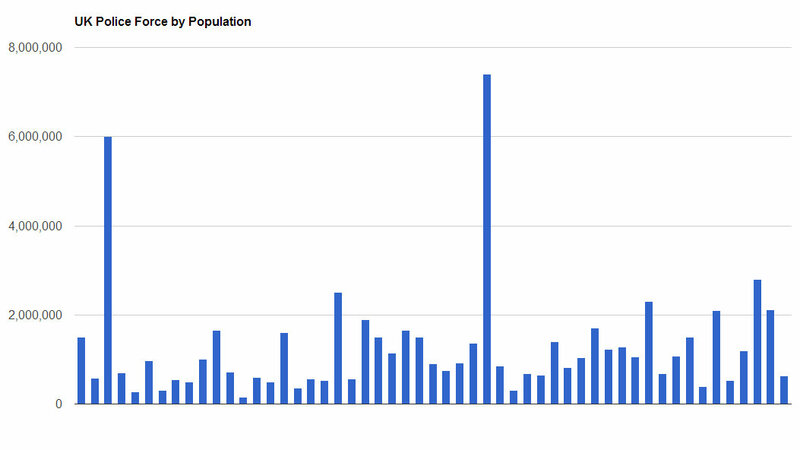 I've looked at the numbers for a US/Canada Police Survey. There maybe a many thousands of forces to list every detail. One step at a time. At this stage, and as a final thought for this post - I want, and we need Feedback. 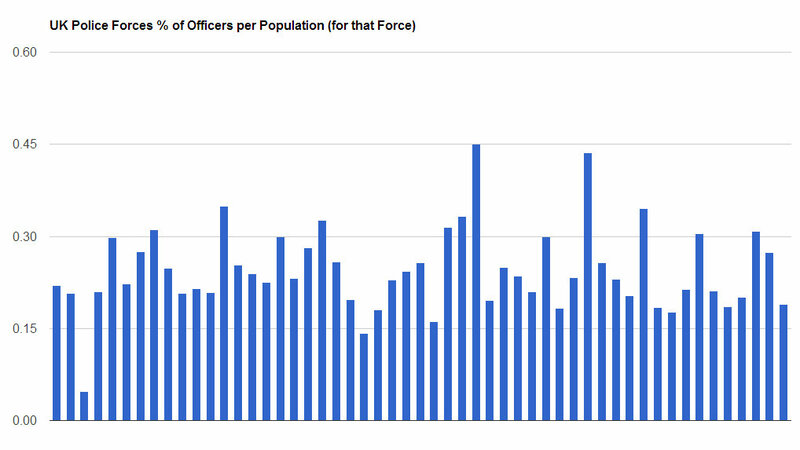 You will see a few calculations on the sheet (like the number of officers, population, density). I know about crime rates, but I'm leaving that for another day. As I said, this is post one of many. For more information, look for the Google+ for Law Enforcement and Policing Community. Chief Inspector +Kerry Blakeman from +West Midlands Police gives a keynote address at the #SMILEConference on 6 Feb 2013 at 4pm Sunnyvale, California (midnight in the UK). That is a superb set of statistics Mike, that really shows the power of social media to meet the needs of the Police to inform the public. Still some holes and gaps but overall it shows that these usages and trends are here to stay.